Which Durango Should You Drive? The 2018 Dodge Durango is a performance SUV with plenty of stylish and practical amenities to please any driver. However, depending on your personal preferences, there may be a particular trim that suits your ideal vision better than others. If you’re having a hard time choosing a trim, here’s a look at all seven to help you decide. This base model features a 3.6-liter V-6 24-valve VVT engine and is capable of towing up to 6,200 pounds in both rear-wheel and all-wheel drive. Its interior is packed with convenience features such as power front windows and three-zone automatic climate control, while the exterior sports halogen headlamps and power heated mirrors. For safety, this model comes with a rear backup camera, an enhanced accident response system, and advanced multistage front airbags. This next trim doesn’t deviate much from the base model, but it does add on optional packages like the Popular Equipment Group and Blacktop Package. The former offers a heated steering wheel, an auto-dimming rearview mirror, and a power liftgate, while the latter opts for Gloss Black accents for the wheels, badging, and outside mirrors. The Durango GT is a step up in terms of luxury. You’ll find standard heated front- and second-row seats, a heated steering wheel, and an optional rear DVD entertainment system. For the exterior, you get the advantage of a power liftgate, outside mirrors with turn signals, and 20-inch Hyper Black aluminum wheels. The Technology Group package is optional and features adaptive cruise control and advanced brake assist. Moving up to the Citadel trim gives you the choice between a standard 3.6-liter V-6 and an optional 5.7-liter V-8 HEMI engine. It also lets you ride in style with 20-inch fully polished aluminum wheels. Performance-wise, this SUV comes with low-beam HID headlamps to help improve your sight when driving in less-than-ideal weather conditions, such as fog or rain. This particular trim doesn’t lack power, that’s for sure. It comes standard with the 5.7-liter V-8 HEMI engine and is capable of towing up to 7,400 pounds. The amenities hardly differ from the previous models, though you will find 20-inch Low Gloss Granite Crystal wheels as something exclusive to the R/T. This next model comes standard with the 3.6-liter V-6, but you can always upgrade to the available 5.7-liter V-8. The Citadel Anodized Platinum also brings something new to the table with 20-inch Satin Carbon Finish wheels, though it’s no longer available with the rear DVD entertainment system or Blacktop Package. The SRT is the only trim you’ll find that’s available solely in all-wheel drive. Additionally, it exceeds the previous models in terms of power and performance, as it comes with a 6.4-liter V-8 SRT HEMI engine and can tow up to an impressive 8,700 pounds. The exterior features 20-inch, five-spoke Low Gloss Black wheels and standards like a power liftgate and mirrors with memory settings. Finally, the interior gets the same comfort amenities, such as heated seats and three-zone automatic AC control, ideal for keeping everyone relaxed during the journey. 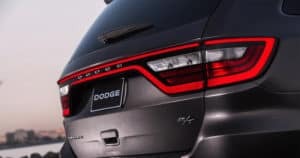 The 2018 Dodge Durango is available in a variety of exciting and unique trims. Which one will you be adding to your collection? 0 comment(s) so far on Which Durango Should You Drive?